We used a total of three 4 fl. oz. bottles of white glue to make this slime, as shown. All types of Elmer’s® Glue work with this recipe. Protect your work surface with a non-stick surface like parchment paper, wax (or palette) paper, and wear an apron (or other protective garment) to protect clothing, as the food coloring may stain. First, use one bottle of white glue to make a batch of your favorite white glue slime recipe. Place the white slime in the center of a piece of non-stick paper (e.g., parchment paper or wax (or palette) paper. Let it slowly spread out into an oval-ish shape. TIP: Elmer’s® has some great recipes; click here to download. Pink Slime: Use one half bottle of white glue to make slime according to your recipe. To get the color shown, add Pink candy food coloring to the glue. TIP: Dip a craft stick into the food coloring jar and then mix it into the glue, according to your recipe’s instructions. Yellow Slime: Use one half bottle of white glue to make slime according to your recipe. To get the color shown, add Lemon Yellow gel food coloring to the glue. Blue Slime: Use one half bottle of white glue to make slime according to your recipe. To get the color shown, add Sky Blue gel food coloring to the glue. Purple Slime: Use one half bottle of white glue to make slime according to your recipe. To get the color shown, add Violet candy food coloring to the glue. 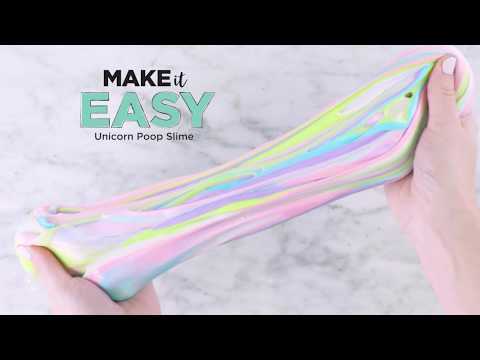 Once your colorful slimes are complete, take about half of the pink slime and roll it between your hands to make a long, thin strand. Place this strand along the length of the white slime. Repeat to add several more pink lines to the white slime. Repeat Step 6 to add several lines of the other three colors to the white slime. When you’re finished, the slime should be vividly striped. Use the image as a guide. Fold and twist the slime until you have blended the colors just the way you like. Be sure to store your slime in an airtight, sealable container or re-sealable plastic bag.